It was no surprise when Henri Schoeman completed a start-to-finish victory in the King Price SA Triathlon Championships and Durban Premium African Cup on the Durban beachfront on Sunday, March 24. As expected for a swimmer who regularly leads international events out the water, the Rio Olympic silver medallist was over a minute quicker than any of his rivals in the opening 400m swim leg and then held his lead throughout the rest of the event. Schoeman had the sixth fastest cycle time on the 40km course which allowed Dylan Nortje, the second-quickest swimmer and cyclist, to close almost onto the wheel of the leader. They were followed through the second transition by the Czech Republic’s Jan Celuska. Schoeman upped the pace on the 10km run and by recording the quickest run leg of the day he made sure of a relatively easy win. Celuska crossed the line second with Nambian Jean-Paul Burger rounding out the top three. Nortje lost over three minutes on the run which saw him slip back to fifth, behind German Jonathan Zipf. In the women’s race, Ireland’s Carolyn Hayes produced consistently quick swim and cycle legs and then had the fastest run time to move through the leading pack and take victory by close to five minutes. Her triumph was underscored by a super-quick run split that saw her overtake Sarah-Jane Walker soon after the second transition and build a big lead over all her rivals. 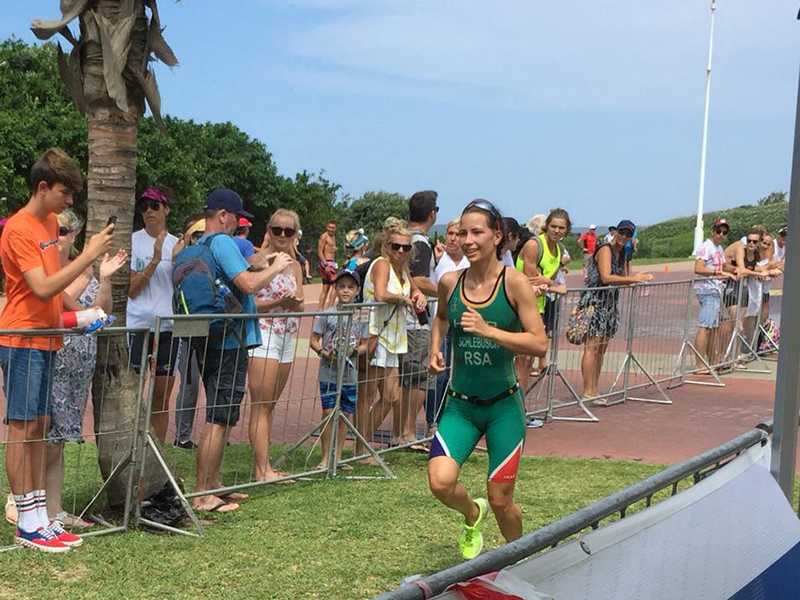 Walker led the swim and the cycle, but was no match for the faster runners and faded to fifth as Jodie Berry took the silver medal and Ashleigh Blackwell claimed the final step on the podium. Burger was the fastest U23 of the day with Nortje second in that age category. In the other events, Haydn Corke was just over a minute faster than Darryn Purtell in the men’s age group standard distance race while Lauren Cannon won the women’s category by nearly seven minutes. The Para Tri Sprint event saw David Jones edge out Rohan Philip Kennedy by the narrowest of margins with Gavin Kilpatrick third. In the women’s race Catherine Van Staden was a clear winner while Cindy Jacobsz just beat Petro Neethling for second. Jamie Riddle and Amber Schlebusch won the 16-19 year sprint events with Christiaan Hattingh and Isabel Guirdham top in the 12-15 year sprint events.